For one week only (May 1st - May 8th) Canon Press is offering over 50 of their titles — both old and new — for a mere $1, $2, or $3 a piece. And you'd better believe I hopped right over and purchased not one, not two, but three copies of one of my favorite of their titles, Face to Face. This is one of the best books I've ever read on hospitality. Sadly, this is a subject that receives little attention these days. We're far more content, speaking as to the culture, to go about thinking about the Almighty Me than we are willing to sacrifice maybe a little time on creativity in order that we may bless someone else. To win? Leave a comment below. Must be a U.S. Resident only and please leave a valid e-mail address for me to contact you at. Sounds like a great book ... I have several hospitality books on my shelf and it a stretch for me, but so worth it. so this book sounds amazing. i am always wanting to find new how to/why books on hospitality! 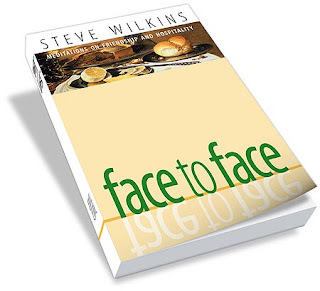 Well, I happen to really like some of what I've hear Steve Wilkins say, though I've not heard him in a long while. I'd love to see what he has to say about hospitality. I can just hear him preaching it with his strong southern accent. So I'll bite. I'm all for hospitality--not very good at in one way. I don't have dinner parties because I've never learned to be a good hostess. But I never turn down someone who needs a ride somewhere or a bite to eat or a place to sleep. I'd like to be more hospitable. PS. I'm very sorry about your loss. What a fine looking young man he was. His last blog post was so encouraging. Thanks for the link and the heads up about the sale! I'll read it! And I checked out the sale...thanks for the heads up! I would love to read a book on hospitality- thanks for the giveaway! As a Pastor's wife we often have our home open to others, but I feel it is still a challenge for me. Hospitality is something that has been on my mind lately. We have a small house and rarely have people over. It's something I'd like to do more often. I stink at hospitality. Really, I do. I try to excuse it, claiming that, well, it's just not my spiritual gift...forgetting of course that the Bible clearly directs me to "Be hospitable..."
Ooh, this is a book that I need to read!